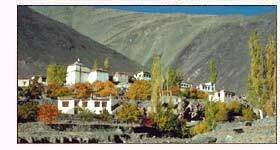 Ladakh is fascinating, proved again, by the beauty of another monastic village called Alchi, in the lower parts of Ladakh. The place is again a hilly terrain, with beautiful temples scattered in the midst of the hills, colorful flags waved off by the winds blowing haphazardly, and amidst all these interesting features, the simple and hard working people of Alchi, makes the place an intoxication for the vulnerable minded. The landscape is more beautiful than can be expressed in words and literally makes everyone spell bound, especially if the person has a soft corner for the hills. It makes an elegant appeal through the Chos-Khor monastery, an inseparable part of Tibetan Buddhist culture. The clay art and the exotic paintings describing the life of Buddha is really worth a human notice, more so if one wants to experience the exuberance of the cold, high mountains. 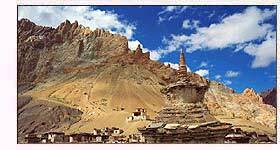 Alchi is located 70 kms from Leh district of Ladakh, situated in the northern part of India, in Jammu and Kashmir. The monastic complex, also called Dukhang is special for the huge main hall inside it, the Dukhand walls are painted with many paintings, different mandalas of the Vajraadhatu, Buddhas four headed sculpture and goddesses and the donors sculptures. At the back of the temple Buddhas four-headed sculpture flanked by four goddesses is a very interesting culpture to investigate the Buddhist art and religious beliefs. The three storeyed Sumsteg, is also a definite destination for art lovers, due to the clay Bodhsattva, one of Maitreya, flanked by Avlokiteswara and Manjushree in the back wall of the temple. These Bodhisattvas are beautifully decorated and adorned with exotic dresses which makes them more attractive. The gallery of the life of Buddha, referring to the Maitreya's Dhoti is also beautiful presentation of art and evokes religious devotion. The Manjushree temple is attached to the translator's temple and the four Manjushree images seated on a common platform, surronded by images of gods and other animals. Air - Nearest airport is in Leh, at a distance of 70 km, and connected to all major cities of India. Rail - Depending on the railways is not the best option for Ladakh visit. The Jammu station is far from the main city, Leh, from where to commute is easier than from Alchi. Road - There are good, exciting roads. Alchi is nearly 540 km from Manali, of Himachal Pradesh and 364 Km from Srinagar, the capital of Jammu and Kashmir.